Is this machine really circa 1936? It seems the 2/4 payout would imply the mechanism is from the late 20s. But the 'look' of the machine seems like it is from the late 50's or early 60's. 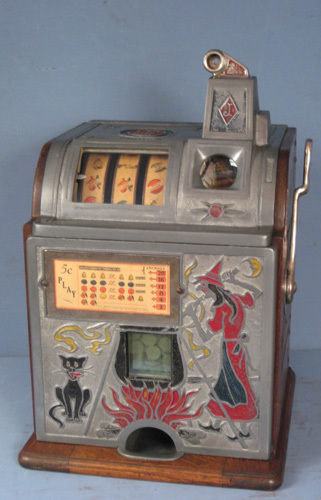 I am not exactly sure what this is, but it is not a 1936 Mills slot machine. My guess is that it is some kind of British machine that originally took the large English penny. It is clearly not from 30s. It has a club handle on it which would indicate late 40s, 50s, or later. I would be curious to know why the seller thinks it is a "1936 Mills Slot Machine". This machine was also listed in the Parts For Sale section. Since it is a duplicate of this listing (and not actual parts for sale), the listing has been removed from the Parts for Sale section. Last edited by radiorich123 on Sat Aug 12, 2017 3:35 pm, edited 1 time in total.